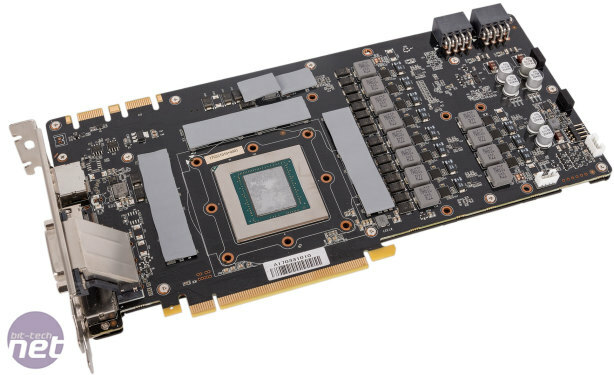 Months keep passing without consumer AMD Vega cards landing, so how exactly the red team will re-enter the premium GPU marketplace and what impact it will have remains to be seen. In the meantime, if you have a hefty wad of notes to throw at GPU hardware, the only real choice is Nvidia, and the GTX 1080 Ti is its finest offering excluding the ludicrously overpriced Titan Xp. 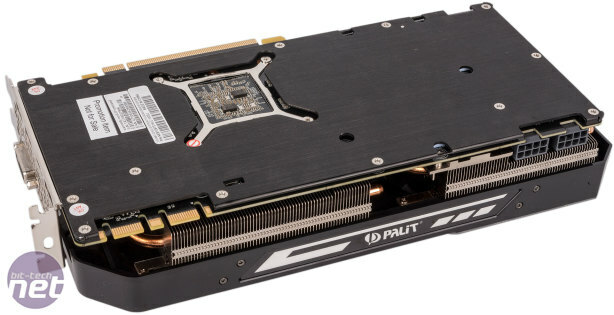 Today we have an card from Palit – can it compete with the numerous solid versions of this GPU we've seen from other manufacturers? The 'Super' in the name of this card isn't only meaningless hyperbole, as it actually differentiates this card from the regular JetStream that uses the same cooler. The difference is that this one comes with an overclock applied, and it's in-line with what we've seen before. Out of the box, the card runs at a base clock of 1,556MHz, and this nets you a rated boost clock of 1,670MHz. This is the card's OC Mode; slightly slower clocks can be set using the built-in Gaming and Silence modes via the ThunderMaster software, but Palit appears to be pushing for maximum grunt by default, which we can't really complain about. One criticism, however, is that the memory is not overclocked and instead left at the default 11Gbps even in OC Mode. Clad in black and silver, the GTX 1080 Ti Super JetStream has a noticeably neutral colour scheme, a wise choice given that the top section is also RGB backlit. This LED section can again be controlled using the ThunderMaster software, with temperature-based effects available alongside others. 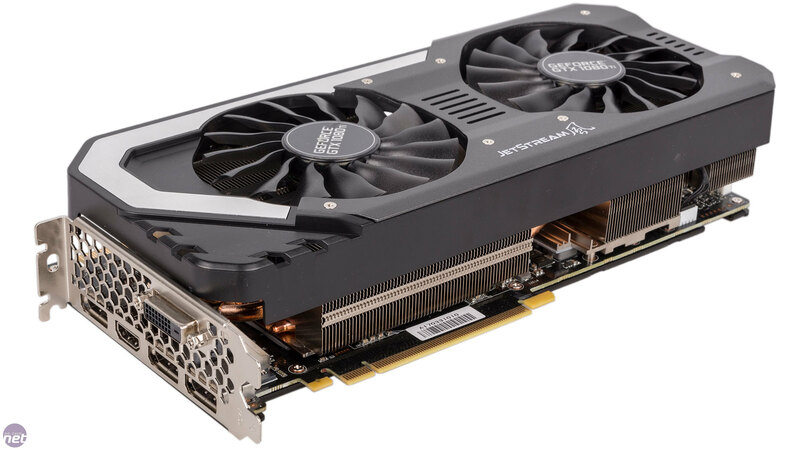 Like many a third-party GTX 1080 Ti, the Super JetStream is noticeable also for its size thanks to a 2.5-slot cooler that increases the dimensions to 285mm long and 133mm tall. Such bulk demands the use of a backplate to prevent the PCB from bending or breaking under the heatsink's weight, so we're happy to see a thick brushed metal backplate here. The keen-eyed among you will have spotted a small cutout in this near the SLI fingers, and this is to give access to the dual-BIOS switch – handy if you're one for tinkering with maximum overclocks or custom BIOSes. 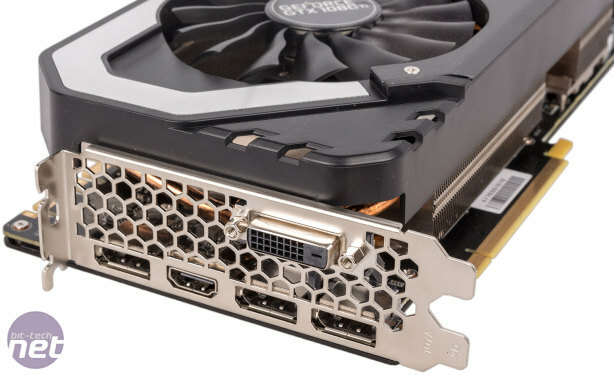 Nvidia dropped DVI support from the Founders Edition of this card, but Palit has reintroduced it here for a bit of extra connectivity. Otherwise, things are unchanged, so you get three DisplayPort 1.4 headers and one HDMI 2.0b. 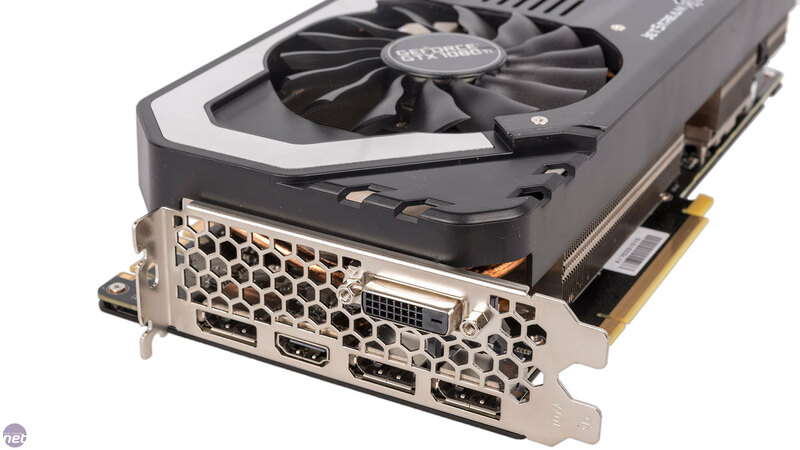 Other manufacturers have taken a more VR-friendly approach by swapping one DisplayPort for a second HDMI, so if you have a VR headset and a HDMI-based display and want both connected at once, there are better options. Also of note on the rear I/O panel is the honeycomb mesh pattern, which Palit says allows for up to 15 percent more airflow than standard designs. That said, it's questionable how much air will find its way here given that the cooler shroud is open and the vertical heatsink fins are more likely to guide air into your chassis through the top of the card or directly at your motherboard. 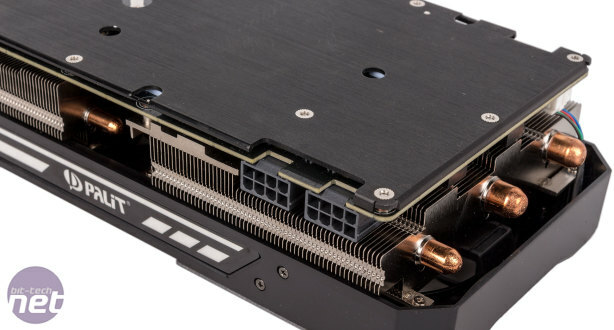 Two supplementary eight-pin PCI-E connectors give the card a total of 375W available power, although it's only rated by Palit as needing 300W, so there should be plenty of headroom for overclocking. Sadly, the plugs are not indented, so you'll need to accommodate protruding PCI-E connectors as well as the card's already-considerable height. Dual-100mm fans are used for cooling, and they spin in opposite directions. This is a method we've seen before, and it is designed to prevent 'airflow conflicts'. We're also told that the TurboFan design of the fan blades is inspired by jet engines. 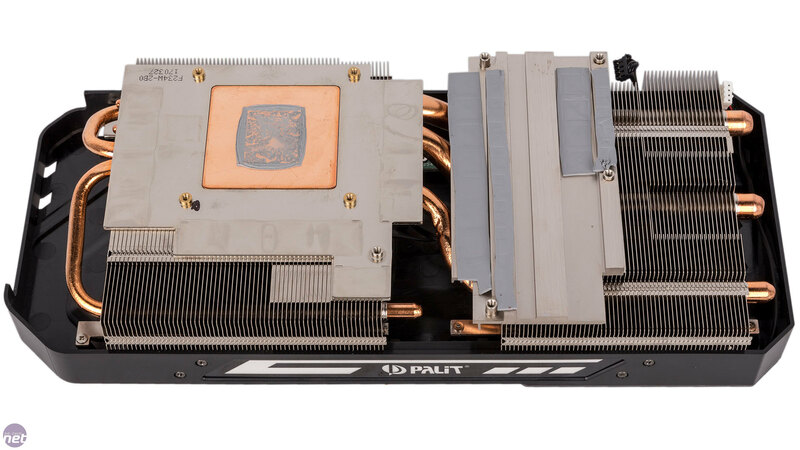 A more tangible benefit is the semi-passive feature that Palit calls 0-dB Tech, which ensures that both fans will switch off once the GPU reaches a temperature of about 60°C or lower. Copious amounts of copper and aluminium are used in the GPU cooler. 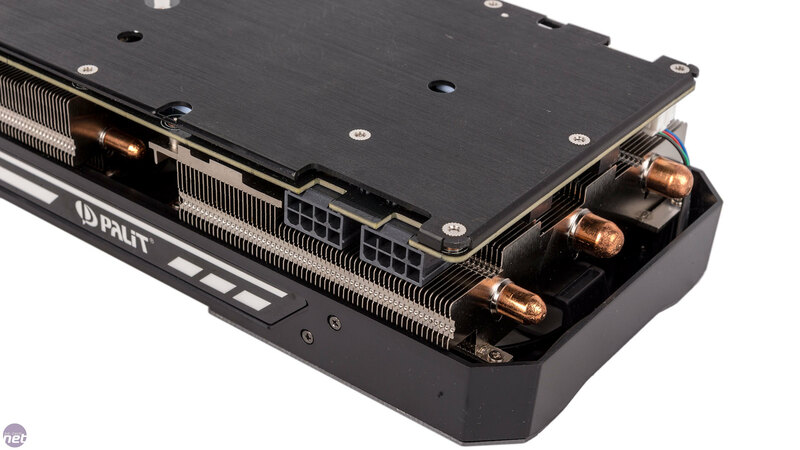 A copper baseplate sits on the GPU and feeds three 8mm and two 6mm heat pipes that in turn direct heat through two separate fin stacks. The copper sections are not nickel-plated, but we're not too worried as they're barely exposed or visible from the outside. The heatsinks are also fed by thermal pads and contact plates that directly cool all the memory chips and the vast majority of VRM components. Palit is using DrMOS MOSFETs here, which use a design it says has been adopted from those used with high-end server CPUs. Benefits touted are low-noise operation and an effective reduction in heat. Palit appears to be using a hefty 12+1 phase power design. One downside of this card versus others on the market is the two-year warranty. 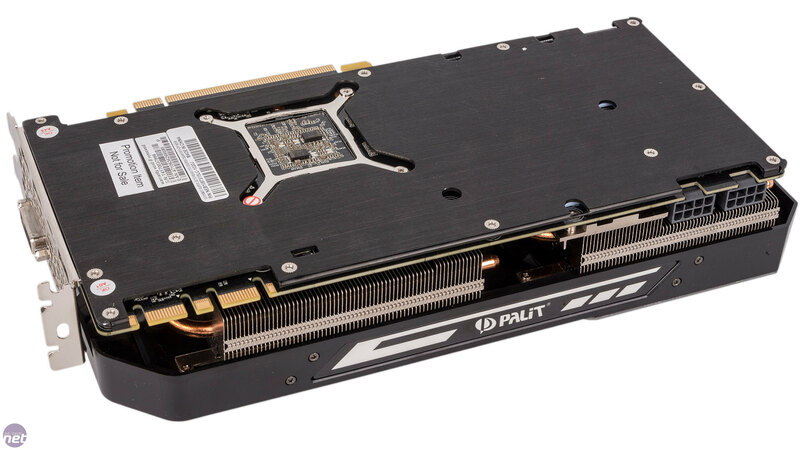 We're used to seeing three years as standard with most GPU manufacturers, and when you're spending close to £700 on a GPU, these sort of things are important – Palit could do with upping its game here. 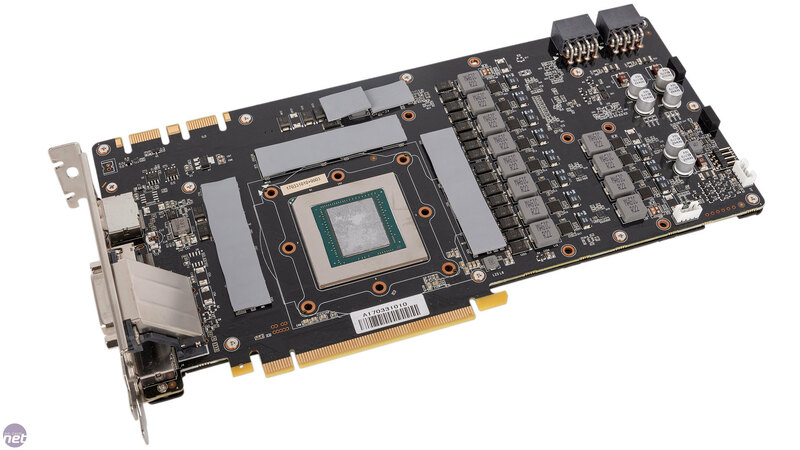 With a combination of air- and liquid-cooling, this card is looking to stand out - can it do so?